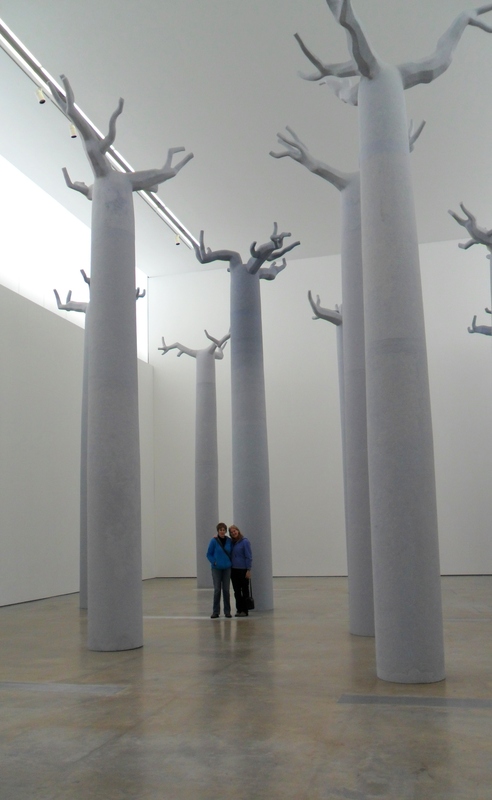 Duckett’s Grove official opening a big success! Dawn and I have had a busy time of it since Chrissie Day and Nigel headed home on Tuesday morning. We’ve taken loads of pictures, I finished a lot of stitching while Dawn caught up with emails and facebook, we delivered my felt to Duckett’s Grove yesterday afternoon, collected mum’s car (because with Danish friend Kirsten arriving we couldn’t all fit in my pick up truck! ), got up early again this morning for the official opening of the new craft and gallery shop, felted in the studio for the first time, was interviewed for the paper, filmed and interviewed for today’s RTE News, collected Kirsten from the bus and then headed home to Clasheen in time for an early supper and to watch the slot on the 6 o’clock news!!! It really was a case of being in the right place at the right time. 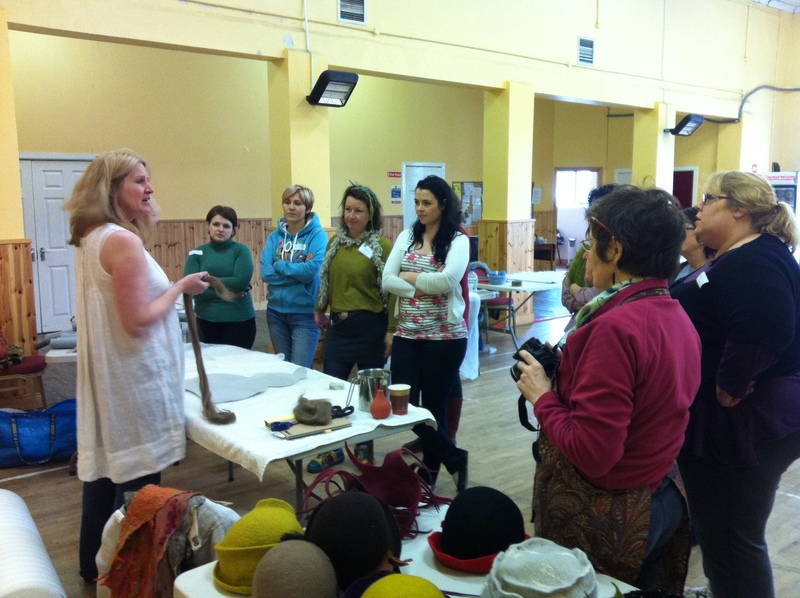 Edel Galvin from Carlow County Development Partnership had asked me if I would do a little felting demo in my new studio after the speeches and before I knew what was happening the footage was shot and I had my short moment of fame. The invited guests at the opening really seemed to appreciate the quality of the work displayed and it’s wonderful to finally have a local Co. Carlow venue to sell high-end craft from. The fact that I have just secured a studio in the complex is really, really exciting. There may well be more workshops available in the future but currently there are 4 local artist makers who will be working from Duckett’s Grove and I feel privileged to say that I am one of them!!! I did think that I would be getting the keys today but there is still a bit of paperwork to complete so although I did get to felt inside the space for the first time today it will be another week or so before it is officially handed over to me! 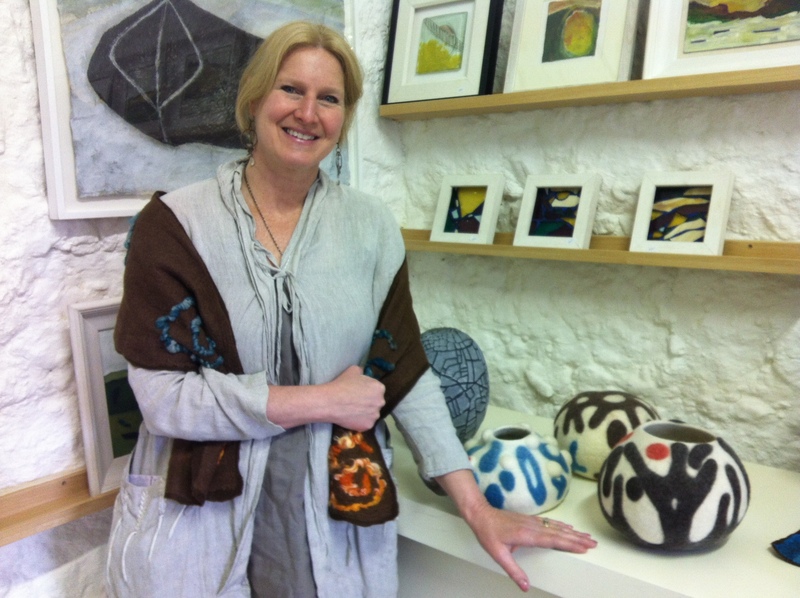 If you’d like to call in and say hello before I head to teach in the US I’ll be there all day on Sunday 6th May and hope to have a workshop schedule prepared for the rest of the summer, there will also be a big craft market in the grounds of Duckett’s Grove and all the studios should be open to the public! 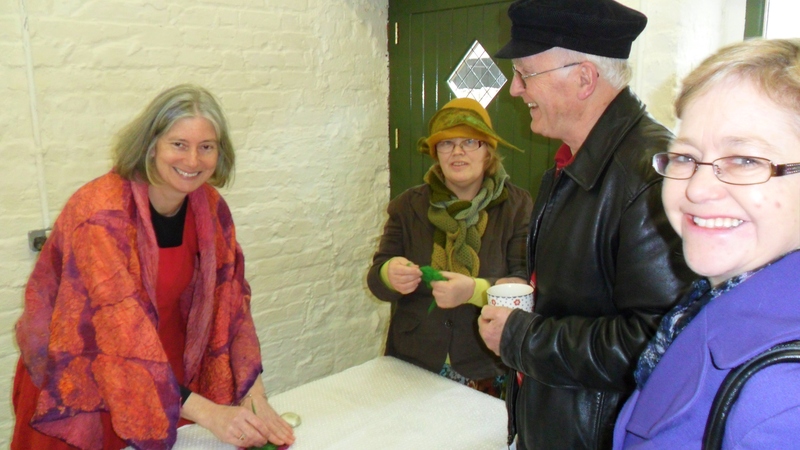 Having fun felting for the first time in my new studio at Duckett's Grove! Check out Dawn’s facebook page for loads of images of the buildings and the opening, she was snapping away and has some lovely shots. Check out this photo of Dawn, doesn’t she look great after a long day and night of travelling??? We’ve talked the hind legs of a couple of donkeys already so for now it’s adieu! 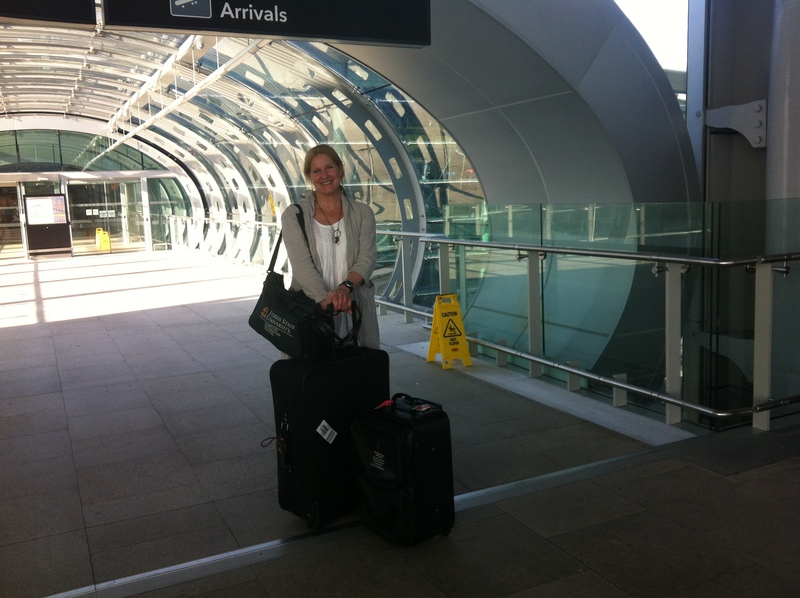 Dawn arrives at Dublin Airport, fit, fun and ready to felt! 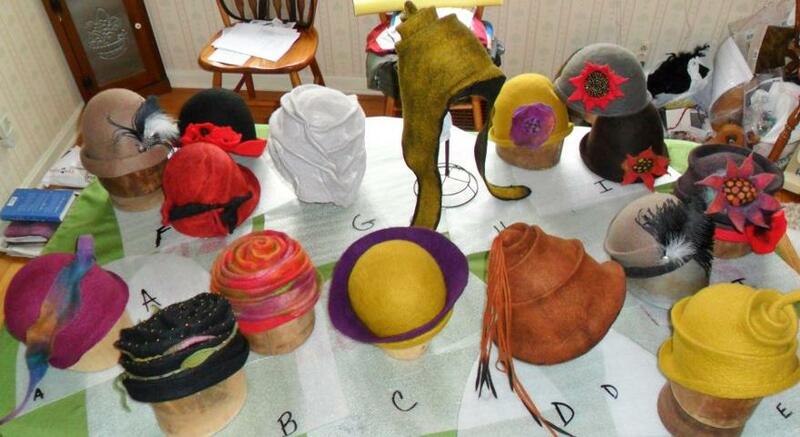 We’re almost there with the book and check out these hats of Dawn’s! Last night I finally finished as much of the book as was humanly possibly and pushed the button to start uploading the files to Chrissie, pity I didn’t realise that I had previously set the computer to switch off after 5 hours, hmm! Anyway, it’s back on now and hopefully by tonight the book will be ready to publish!!! I’m off for another session of CRAFTed today and then I’ll be shopping and organising in preparation for Dawn’s arrival tomorrow morning, I’m so excited!!! 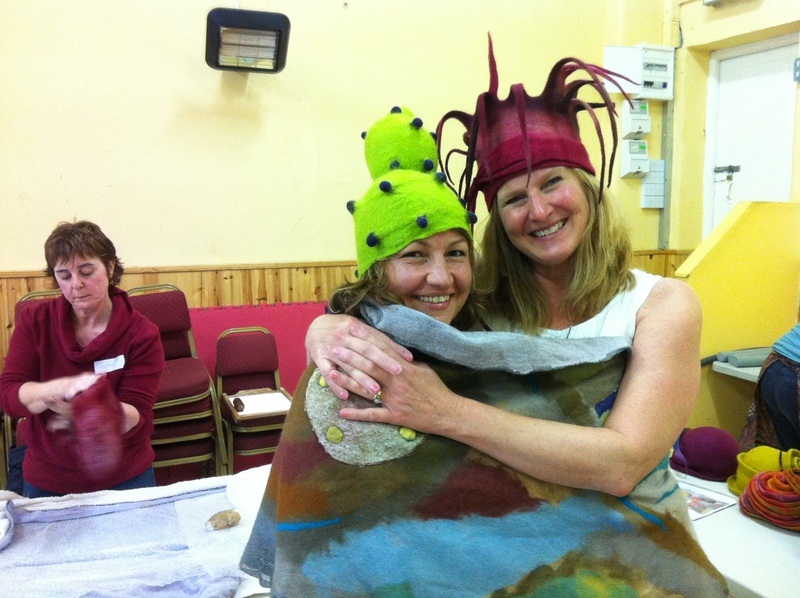 I can’t imagine how difficult her packing must be, check out this picture of the wonderful hats she’ll have at Borris Town Hall on Saturday and Sunday for our two ‘Fantastic Felt Hats’ workshops!!!!! 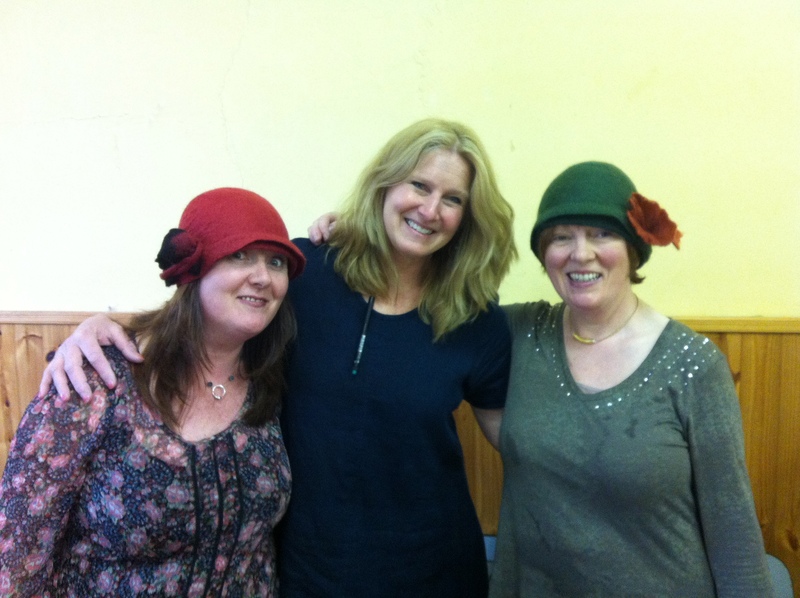 Dawn's amazing hats ready to pack for Ireland! OK, it’s not totally blowing up a gale outside but it is pretty difficult to take pictures of completed pieces for the book without everything almost heading over the fence and into the field, nuno felt can be so lightweight, help! I’ve been trying to wrap up so many things today, I’m not finished by a long shot and in fact can’t see much light at the end of the tunnel yet. I have however managed to get some washing done and out in the wind to dry and shortly I’ll be taking a break before returning to the computer in the evening. I feel like I’m tied to the thing at this stage and would love to be in the studio felting instead, not a hope this weekend unfortunately!!! 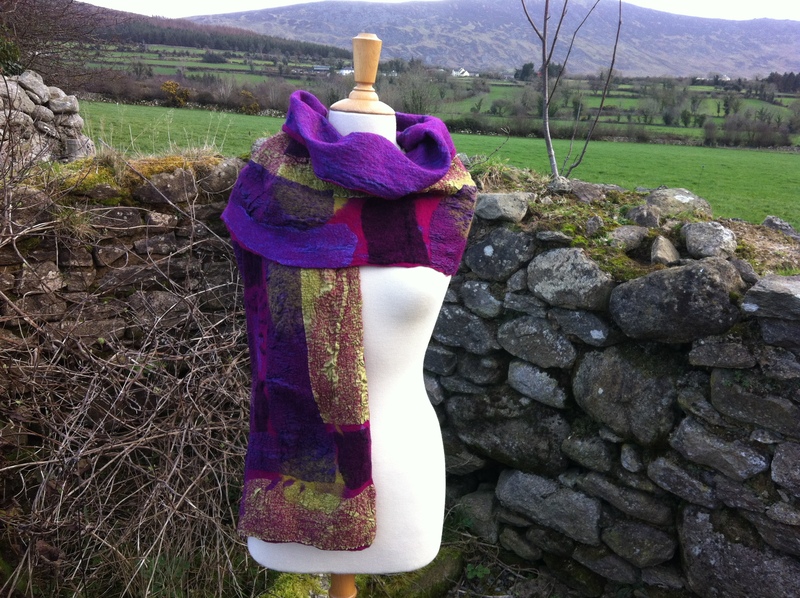 I'm offering a large collaged nuno wrap in colours of their choice to the winning bidder in the Helping Herd auction. This image is just to illustrate the sort of wrap I'm talking about! For those of you following me on FB you may have seen that I’m part of the Helping Herd, a group set up to raise funds and help Chris and Christina Silver of Earth Art Cashmere to get back on their feet after a fire devestated their farm in Novia Scotia. An online auction is currently underway (until midnight on April 27th) for some beautiful hand made goods and supplies that have been donated, I’m offering a large collaged wrap which I will felt to order for the winning bidder. Please consider donating something to help this worthwhile cause or placing a bid on one of the items that are already online, I wouldn’t blog about this if I didn’t feel it was important to support other fibre producers and artisans when something as dreadful as a fire has impacted on their livelyhood. Finally for today I’m heading back outside to try and take some photos again, wish me luck!